If you must keep your dog outdoors, construct an excellent dog house and kennel based on considerations of your dog’s breed, age, health status, your climate and environment, and safety and health features. Schedule daily activities so that your dog doesn’t become depressed or frustrated, leading to difficult behaviors. Never chain your dog. Watch for winter’s trio of common hazardous chemicals that can sicken or even kill dogs and cats when they lick their feet: antifreeze from leaks, ice-melt crystals, and road salt. Avoid walking in them when possible and be sure to clean paws after exposure. Consider using dog boots or coating pads with protective balms. Spread the word! In the wake of the huge winter storm affecting our nation’s temperate zone, many pet owners will purchase some of these chemicals for the first time. And their curious pets will encounter these curious new substances and smells. Antifreeze is lethal. Even a teaspoon of the sweet substance licked from paws or a garage floor will kill. Many states now require manufacturers to add bittering agents to repel ingestion by companion animals and children. Wipe up any spills and drips and scrub residue with strong detergent. Homeowners spread ice melt chemicals on sidewalks and driveways to keep families and vehicles safe from accidents. Then the pets and little ones rush out to play in the new snow. Walk around these chemicals when you can safely. Back at home, be prepared with bucket and towel. Dip furry paws in a bucket of water when returning indoors and towel dry. Wipe a damp towel around the bottom of human boots and shoes to prevent these chemicals from getting on your carpets and floors (store them on plastic boot trays). Road salt might be spread on your community’s roadways to help keep drivers safe from accidents. When taking your pet for a walk, avoid the roads or walk on clean snow if it isn’t too deep. If your pet strayed into the road, be sure to dip paws into warm water, swish around, and then towel dry. Keep your dog’s nails trimmed so that toes aren’t forced apart by splayed nails, which could allow cold snow or slush to reach tender skin. For long haired dogs, trim the hairs between the pads to prevent cold, painful ice balls from forming. Consider coating your dog’s pads with protective balms such as “Mushers Secret” or “Bag Balm” or even Vaseline is helpful. Urgent: Extreme cold kills outside tethered dogs and cats, especially those animals without heavy coats, the malnourished, the very young and the elderly. Tethered animals in southern regions are at higher risk for hypothermia because they have not grown heavier coats over time like they would have in cooler climates. Watch for animals that don’t have adequate shelter; speak with owners or call the authorities immediately. Short-hair pets in the south need hay or straw bedding during cold snaps. Fur is not enough! 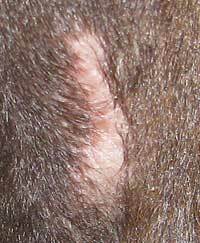 While all dogs and cats have outer fur and inner fur, the quantity of outer hairs of the fur compared to the inner hairs of the fur (ratio) varies by breed and individual. The texture varies as well. Age matters: it takes six months on average for puppies to grow a complete fur covering of inner and outer fur, if they are healthy. Some breeds can tolerate extreme cold if individuals are healthy and shelter from freezing winds is available. In addition to breed and health, environment matters too. Individual dogs and cats living outdoors in cooler northern climates will grow longer, fluffier inner fur as daylight shortens that will help hold body heat. But pets in the mid- and far south have not experienced wide swings of seasonal cooling. Their sparse, short inner fur is completely inadequate for sudden winter cold snaps, freezing winds, and snow storms. Short-hair dogs are very vulnerable to hypothermia. In other words, during a cold snap in Mississippi, that bouncy little Boxer puppy down the street that is tied to a tree 24/7 could be found dead in the morning. Those skinny hunting hounds kept in tiny outdoor pens could suffer from hypothermia and frostbite and the old ones might die. And those skeletal, near-feral pit bulls tied to stakes that sleep in hard hollows dug in the earth? They have never known a kindness. They may be released from their long suffering. Do you have access to bales of hay or straw? Can you give hay beds to short-hair outside dogs in your neighborhood when a cold snap is on the way? A simple bale of hay can mean the difference between life and death to a dog or cat down south when the cold winds blow. Owners probably will not object. Please help those outside animals. Watch and listen for chained or kenneled dogs and “outside” cats during subzero weather—without adequate shelter, fresh water, and extra food, they can get frostbitten or freeze to death. Please take action. Did you know subzero weather anywhere causes suffering for outside dogs and cats? Our rescue pit bull mix dog, a short-hair dog, Duffer, has hairless spots on his legs; see the picture. Our rescue cat Tillie has slightly rounded ear tips. Their skin was permanently damaged from frostbite. Imagine what that must have felt like in the bitter cold. Of course they would have both somewhat accustomed to cold weather living in Wisconsin. Of course each one would have sought out the most sheltered spot available. The shivering would start and pause at times, as the wind would rise and fall. Then the shivering would increase. The chill would seep deeply into their bones. They would carefully round themselves into new positions fighting to protect one body area and then the next. And they would cry out in pain. Eventually hypothermia would set in and they would feel as if burning up and they would try to cool off. Then the cold would kill them. Have you ever heard a dog barking nonstop on a cold night? One neighbor in Minnesota talked about her neighbor’s dog to reporters. The dog had barked nonstop until past midnight. The next morning she saw the poor dog laying flat outside next to his plastic igloo dog house laying very still. He had frozen to death while in the throes of hypothermia. He suffered terribly. She felt very sorry for not calling the police, but her neighbor who owned the dog was the mayor of her small town, and she didn’t want to challenge authority. What would you have done? One bitterly cold and windy winter morning at the shelter where I volunteer a cardboard box was found on concrete next to the north-facing front door. Two hypothermic kittens, possibly 12 weeks old, were huddled together inside with not even an old scrap of fabric to help them hold a little bit of their heat. They were near death. Shelter workers were able to revive them in warm water. Remember all cats are at risk of freezing to death if they are not free to seek shelter. All short-hair dogs without an inner layer of fur that are chained or kenneled are at risk of frostbite and death. And plastic igloo dog houses do not provide any insulation. Zero. They must be fully packed with hay or straw in the winter no matter where you live. Old rugs are not enough insulation when winter’s cold storms roar. How about giving a bale of hay or straw to a needy dog or cat this holiday?